Mortgage discount points are one of the most important concepts for a borrower to understand. They affect the total amount of interest paid over the life of the loan, and also the size of the monthly payments. But judging by the emails we receive, a lot of home buyers and homeowners don’t understand (A) what mortgage discount points are, and (B) how they work. Fortunately, it’s a fairly simple concept, once you understand the basics. So let’s jump right in. What Is a Mortgage Discount Point? Mortgage points (also referred to as discount points) are fees a borrower pays to a lender in order to secure a reduced interest rate on a home loan. These fees are typically paid at closing and count toward the borrower’s closing costs. One point is equal to 1% of the mortgage amount being borrowed. For a home buyer taking out a $300,000 loan, one discount point would come to $3,000. That’s $1,000 for every $100,000 borrowed … or 1%. Let’s talk more about how mortgage discount points work, and how they might work to your advantage over time. Points typically have an inverse, or opposite, relationship with mortgage rates. The more points you pay, the lower the interest rate you’ll receive from the lender — and vice versa. This is usually how it works, and it’s why so many borrowers choose this option in the first place. For some borrowers, the highest priority is to reduce the monthly mortgage payments and the total amount of interest paid over time. This is where discount points come into the picture. By paying points at closing, the borrower can essentially “buy down” the interest rate. Sure, it means paying more money up front, on closing day. But it has the potential to save you a lot of money over time, if you stay in the home past the break-even point (as explained here). How Much Will It Reduce My Interest Rate? Unfortunately, mortgage discount points (and their corresponding rate reductions) are not standardized across the industry. The amount by which the rate gets reduced will vary slightly from one lender to the next. So the best we can do is talk averages. According to Bob Walters, chief economist for Quicken Loans, the general rule of thumb is that one discount point will lower the mortgage interest rate somewhere between 1/4 to 3/8 on a 30-year fixed home loan. That might not seem like much at first glance. But when you project that rate reduction over a repayment term that could last for many years, the savings can really add up. The chart below, provided by the Consumer Financial Protection Bureau, shows an example of the trade-off described earlier. In this example, a person borrows $180,000 on a 30-year fixed home loan, and qualifies for a mortgage rate of 5.0% with zero discount points (middle column). In the first column, the borrower chooses to pay points for a reduced interest rate. In third column, the borrower chooses to receive lender credits to reduce closing costs. So now you know how mortgage discount points work, and what benefits they bring. The next logical question is: When does it make sense to use them? This will depend on your short-term versus long-term priorities. For: If you plan to stay in the home for a while — and you’re mostly concerned with reducing your monthly payments and total interest costs over time — then paying discount points might be a good option. The longer you keep and repay the loan, the more you benefit. 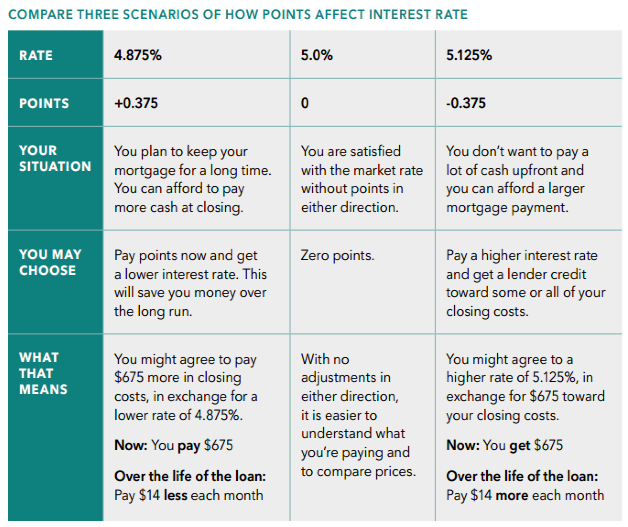 Against: If you need to reduce your closing costs because you don’t have a lot of money in the bank right now, you might want to choose the “zero points” option and just accept a slightly higher interest rate. When you apply for a home loan, you can ask your lender to show you (on paper) how your interest and payments will break down with and without discount points. This will help you weigh the pros and cons. And in this context, the pros and cons are lifetime savings versus upfront costs. There are some stipulations. The home in question must be your “main home,” meaning the one you live in most of the time — as opposed to a vacation property. Additionally, the points you paid must have been “computed as a percentage of the principal amount of the mortgage” and must show up on your settlement statement. But far be it from me to offer tax advice. Follow the hyperlink provided above to hear it straight from the IRS.